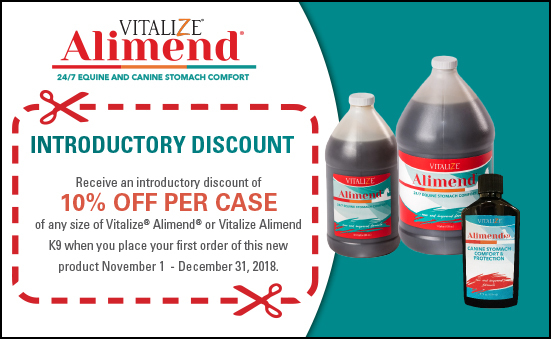 Receive an introductory discount of 10% OFF PER CASE of any size of Vitalize® Alimend® or Vitalize Alimend K9 when you place your first order of this new product through December 31, 2018. With the launch of Vitalize® Alimend®, we have added it as an eligible product to the Single Dose Product list. For every $4.50 of Vitalize Alimend or Vitalize Alimend K9 purchased now through December 31, you will earn a ticket into the prize drawing. 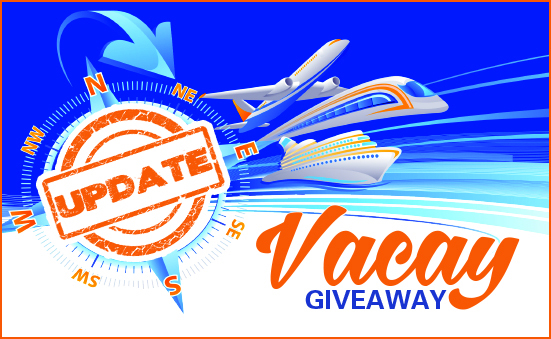 Did you know that your purchases of a “new product” are cumulative during the entire vacay giveaway period? Example 1: If you have never purchased Vita Charge® Cattle Drench prior to July 1, 2018, every $4.50 of Vita Charge Cattle Drench purchased July 1 – December 31, 2018 will earn you a ticket into the prize drawing. 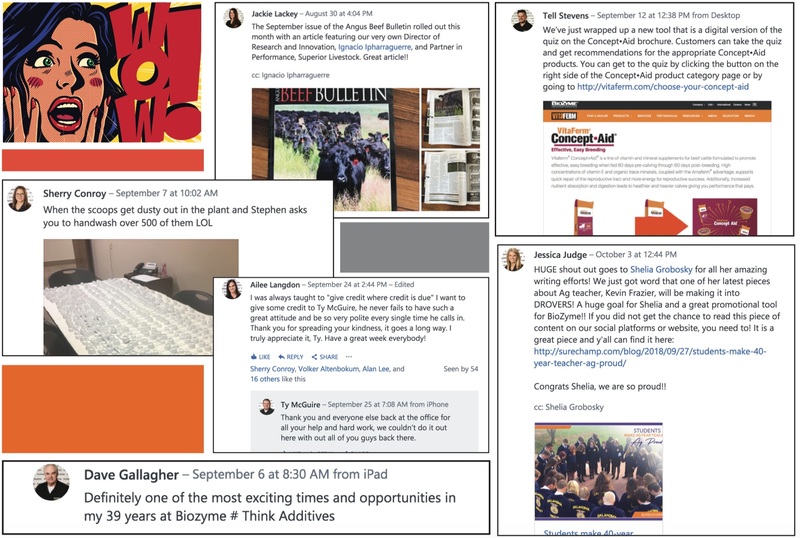 Even though she’s been a BioZyme® dealer for just over a year, Megan Souder doesn’t consider herself a salesperson. She likes to think of herself more as a problem solver, and customer service is the key to her success in her first year. Prior to joining the dealer network in September 2017, Souder, from Mount Holly Springs, Pa., spent 18 years in the pet industry, serving as a company representative selling cat, dog and other small pet products to stores across Pennsylvania. She also cared for her own animals, a mixed herd of sheep, goats and alpacas. But, when a trusted friend and mentor suggested she shift gears and start selling BioZyme and Umbarger products, it was the nudge she needed to become her own boss and help her friends and neighbors with their livestock, too. Souder conveys her knowledge to customers and potential customers. She uses the Online Dealer Center and has completed the Master Dealer Training Program. She shares links to the YouTube videos about the products, so her customers have every opportunity to learn and hear others’ testimonials. She also relies on the Outreach Support Center to help provide her the supplies and information she needs. “Jen Miller has been fantastic to get me anything I need from the inside to help me represent the products,” Souder said. Another reason Souder says she is successful is because she is able to focus on limited brands and products, giving her attention to just two companies’ product lines. “I only carry these two lines –BioZyme and Umbarger because I’m a specialized store and I think the focus is key. I want to be excellent at a few things rather than good at many,” she said. Her “store” is more of warehouse located close to home. She doesn’t keep regular hours, but her customers know she is just a call or text away if they are running low on product, need something specific or are in the area in the evening and need to “drop by” and pick something up, just another way she can provide excellent customer service. As for her customer successes, she said each one has their own success story, and it pleases her when a customer calls, texts or emails her with a photo of their animals and their results. She often shares these results on her Facebook or Instagram for others to see. She said the goat breeders who use both loose mineral and stress tubs, have claimed to see decreased toxemia in their does during kidding time and also have higher conception rates and better egg counts when they do A.I. Sheep breeders and exhibitors who have used Sure Champ® Climate Control say their sheep are less stressed and breath better during the heat. And, cattle people love the Vita Charge Stress Tubs to quiet down the fresh-weaned calves and calm down new arrivals. “My customers are awesome and every one of them have their own success stories. My customers want to promote these products because they have worked so great for them,” she said. 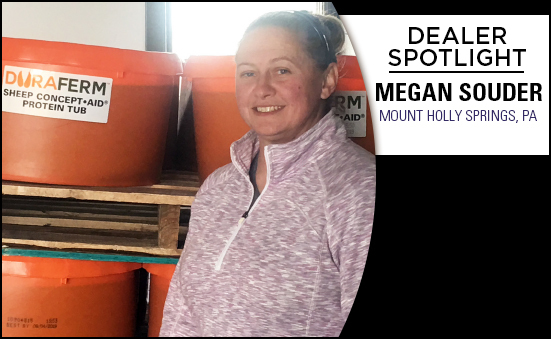 Listening, solving problems, and being available for her customers have helped Megan Souder achieve dealer success in her first year. Yet, she said she doesn’t really look at the tonnage sold, just the number of people and animals she’s helped. “I started with a blank canvas. I just look forward to what my future holds. I make changes daily to how things will go to best utilize my time,” Souder said. Chances are you wouldn’t be selling the products you offer if you didn’t believe in them. In fact, the 2017 Dealer Survey results show that 82 percent of BioZyme® dealers already use the products they sell. So, that personal experience is one way to share your story and tell how the products work in your operation or on your companion animals. However, a plethora of animal nutrition products exist on the market. 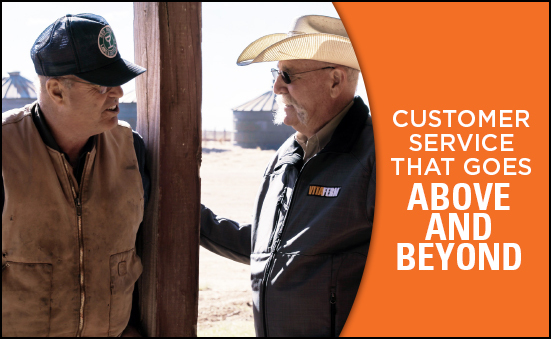 And even though we know that our BioZyme supplements are unique due to the Amaferm® advantage, sometimes the best way to WOW your customers is by focusing on your service attitude versus constantly talking about your products. Being present where your customers are is just one way of providing service marketing. If they are harvesting, they probably haven’t taken time to think about their cow herd’s nutrition prior to calving or even thought about placing a mineral order. But, you probably have. Reach out to them with a sack lunch or an afternoon drink while they are harvesting with a gentle reminder of how many days are left in this year and a list of the mineral they purchased from you last year at this time – making their lives simplified, and potentially making a sale for you! Another service you can provide is to simply listen. This is a great time of year to host producer meetings. However, the interaction shouldn’t always be about the dealer talking about new products or special promotions. Take time for an open discussion. Hear what is on the minds of the producers and end-users of the products and see how you can provide a service you haven’t already thought of. “No one knows your customers and your community better than you do, which is what makes local dealers so incredibly vital and important to our company. If anyone ever wants to bounce ideas back and forth or see what tactics have worked best in a community like theirs I’m always available via email,” Fitzsimmons reminds the dealers. Providing a service and listening to your customers – you have just turned two traditional customer service tactics into marketing plans to help you reach your customers in a way that will WOW them. Everyone likes to have a service provided to them, especially when it is unexpected. And, when a customer is listened to, it makes them feel more like a part of your team. Use these two marketing tools to wow your customers this fall and see your sales grow! As the calendar year-end draws closer, many individuals and businesses look for charitable causes to give to. With the holidays near, it is in our hearts and on our minds to give to those who might not have the same advantages we have. But have you thought how you can best make an impact on others? First, you need to select just a few worthy causes to donate to. 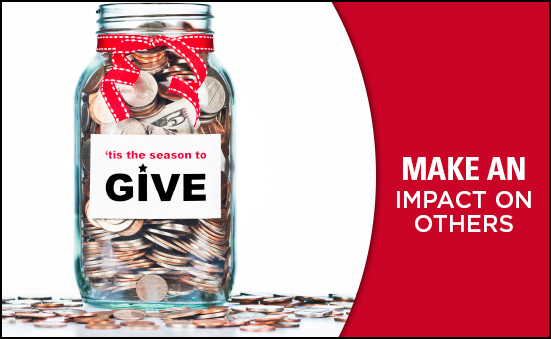 Your dollars will make the biggest impact if you don’t spread your gifts too thin over too many charitable organizations. Determine how much you want to spend, and then decide if you want to give all of that to one group or split it two or three ways. Next, determine how your funds will be used. Does your donation really go toward helping others or will it go to administrative and further fundraising fees? Ask the organization outright. You might be surprised to learn that only 25-percent of your donation goes to the cause. If that is the case, determine if that is a cause worth supporting or is there another charity or individual you can give to? If you are unsure, visit www.give.org and search for your organization, to learn more about the cause and their spending. Then, choose a cause or organization that is near and dear to your heart. Does someone in your family suffer from a disease that you are passionate about? There is most certainly a group that is raising money for research for a cure to that ailment. Do you care about helping kids whose only meals are what they get at school? Perhaps you’ll want to learn more or donate to Snack Pak 4 Kids™. Maybe you were once involved in 4-H or FFA, Girl Scouts or Boy Scouts, or another local youth organization in your town. It’s always nice to give back to an organization that made a personal impact on your life. Perhaps you are new to your area, and don’t know where to donate, but want to keep your gift local. Talk to local clergy, someone at the bank or even local law enforcement officers. They are likely to know of local programs like “adopt a family” programs, “shop with a cop”, shelters or food pantries that always appreciate extra financial help around the holidays. It doesn’t take a big check to make a big impact. If each person donates what he or she is comfortable with, those donations do add up. Pick the organization or groups you would like to help this holiday season and share your joy with others. Make sure the cause you are supporting uses your funds for its programs, and give with a glad heart. Just like your customers and their personalities all vary, so do the ways that they like their customer service provided to them. But one thing is certain, everyone likes to be treated with respect and courtesy, especially when paying for a product or service. It doesn’t matter if you’re talking face-to-face, over the phone, via email or through a hand-written letter, there’s always ways to show that you care for and respect your customers. Using key words and phrases are just one way to make sure your customers feel appreciated. While you are putting these key phrases to work, make sure you are using them on all your customers and potential customers, not just a select group of customers. You never know when going above and beyond or out of your way to contact someone who hasn’t bought much lately might just sway them to start doing more business with you. Or, perhaps they have been considering changing their mineral program, but didn’t know how to ask about VitaFerm®. By making that investment in time, you further build your relationship and watch your sales grow. It is impossible to talk to everyone every day, or every week for that matter. Make a schedule of who you will reach out to and when. Sometimes we reach out too often, so find a way to track your conversations and when you last reached out to each customer. This could be in your database management software, an excel spreadsheet, a calendar or even in a notebook. Just make sure to contact everyone regularly. “The Outreach Support Center reaches out to customers every 45 days, either by phone, email or mail. When we contact dealers, we make sure everything is going well, ask if they need literature, answer any questions they may have and update then on any new products or any changes that may be occurring. BioZyme® lives by the motto, ‘Care that Comes Full Circle.’ I believe we are doing that in the Outreach Support Center by reaching out to the customers to let them know we value their business and we are always there if they need us,” said Jennifer Miller, Director of Outreach Customer Support. A few unpretentious words. A handshake and a smile. Regular contact with your customers. All of these might seem simple but use them in conjunction and on a regular basis, and you’ll provide customer service that goes above and beyond. 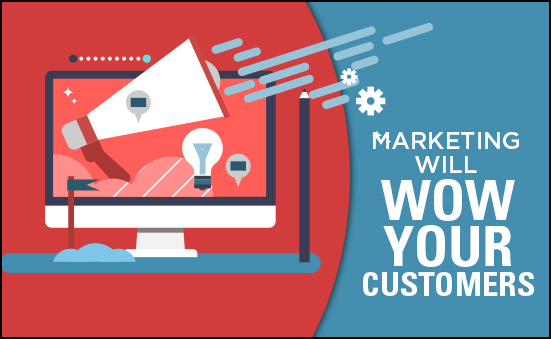 You might just “wow” your customers. A verb by its nature implies action and at BioZyme ® , we encourage action that drives a WOW, so it is wowing. 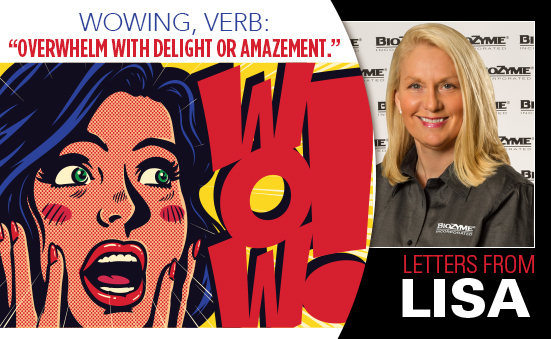 Wowing things are unexpected and have a strong, pleasurable impact. After a wowing thing happens, the receiver mentally thinks WOW. That’s exactly what we want to do; quietly do things that we hope wow our team (that’s you) every day in every way. My letter this month shares six wowing moments. At this thankful time, I give thanks for all wowing moments. What are yours? 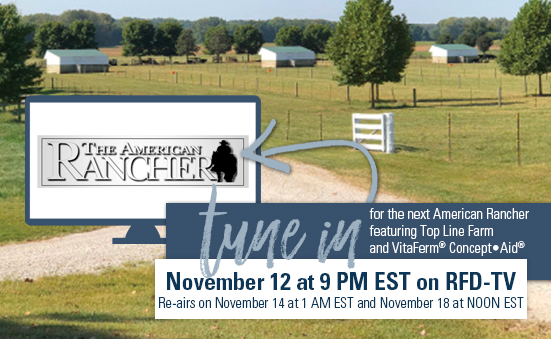 Set your DVR and remind your customers to tune in November 12 at 9 PM EST on RFD-TV for the next American Rancher featuring Top Line Farm and VitaFerm Concept•Aid! The show will re-air on November 13 at 1 AM EST and on November 18 at NOON EST.